Gone are the days when everything is printed and in some form of hard copy. The same way that paperback books have given way to Kindle type devices, the same is true for infrastructure documentation. All of the Janco's offerings that come a .epub files are also provided in PDF format. The full version of the products also are delivered in MS Word format. For example, if a CIO is looking for a new employee with particular skill set, he does not want to go back to pencil and paper to create the position requirements. Rather he would search his electronic job descriptions, select what he needs, and pass that on directly to the recruiter -- electronically. The documents are delivered electronically and have a suffix of .epub. These can be viewed on PC, tablets, SmartPhones, and Kindles. 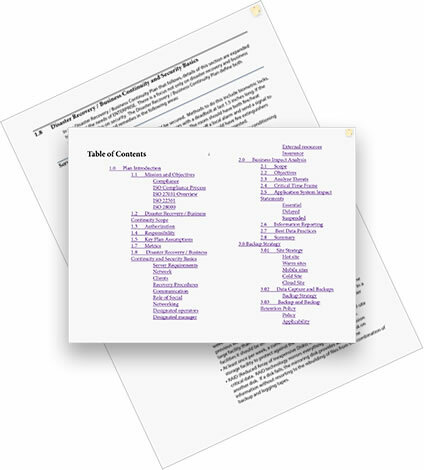 All of these documents come with a active table of contents, are fully search-able, and can be shared across an enterprise's network. Only selected Janco offerings are provide in ePub (eReader) formats. These offerings are meant for reading and extraction. We do not recommend alerting these offerings. The eBooks have a full table of contents and based on the eReader the user selects are full search-able. This material is not for re-sale or redistribution. However the purchaser is obtaining a limited use license for one company (DUNS number) in one country. For use beyond that a special license is required. Janco retains the copyright on the core document and derivatives of electronic document cannot be resold or given utilized by third parties. If there are any questions they should be directed to Janco. See contact us on the main menu. Note: The forms within these eBooks are not designed for the all devices that they can be viewed on and are NOT interactive. In order to get those options you need to acquire the full version of these offerings.